Exercise machines are commonly found in gyms while making rare appearances in home gyms. The reason for this is because the majority of machines are created with one muscle group in mind, making them great for isolation exercises but leading to high acquisition costs as one machine for one muscle group becomes expensive quickly. Most people exercise at home to get in quick and effective workouts but using a method that only targets one muscle group during a single lift takes additional time compared to free weights that are able to target several muscle groups at once (making free weights great for compound muscle exercises). Aside from being able to isolate muscle groups, exercise machines offer another key benefit: safety. Due to the nature of exercise machines, they do not allow freely moving parts (think of a barbell in deadlifts). This enables the user to perform exercises until muscle failure without the risk of a bar or weight crashing down on them. A great example of this safety benefit is with machine presses (instead of military presses with a barbell). The weight goes over the head exposing the user to a variety of safety concerns which are instantly alleviated due to the guided lifting track of the machine. It should be noted that some free weight racks/stations do come with safety bars. 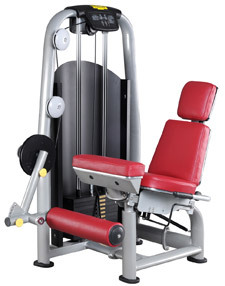 There are exercise machines available to target every muscle group of the body but they are all similar in regard to the adjustable level of resistance. This is achieved by changing a specific resistance setting on the machine (less common than the other two methods), by adding more weight plates to the machine (see leg press), or by moving the pin in the weight stack (see pec deck). The pin and weight stack method is the most versatile to use as it only takes a second to pull the pin out and place it back in, resulting in an immediate change in desired weight. This can be particularly effective when exercising with a workout buddy. Unfortunately, due to the fixed nature of exericse machines, it can be difficult to customize the device for an individual's needs. Many machines offer several adjustments like seat height, back pad position, etc. but there are a limited amount of hand positions available (save for cable machines that utilize interchangeable grip attachments). This can be particularly frustrating on machines designed for exercises like machine bench press. With the free weight bench press barbell exercise, one is able to go for a standard, wide, or narrow grip thus adjusting the focus of the exercise. With a fixed position machine, these hand position options are generally unavailable or quite limited in nature. When using an exercise machine, there are a few items to be aware of before and during the lifting process. Prior to lifting the weight, make sure the cable looks secure and is in good working order. The cables used in these exercises often lift a large amount of weight and have been known to snap. It is also recommended to perform a few light weight warm-up reps to ensure the cables and pulley's are properly lubricated without sticking points. Occasionally, these sticky spots will add a great deal of resistance while performing exercises.